I cannot wait to start picking fresh berries this summer! I missed out last year and I was pretty sad about that, but there's no way this year that' s gonna happen. I'm too excited! P.S. I baked. I will get on sharing that very soon! And the photo is great, wonderful colors! Great photo. I also can't wait for a pile of fresh fruit. Just bought Connecticut strawberries today...flavor!!! Yum! Absolutly gorgeous photo! 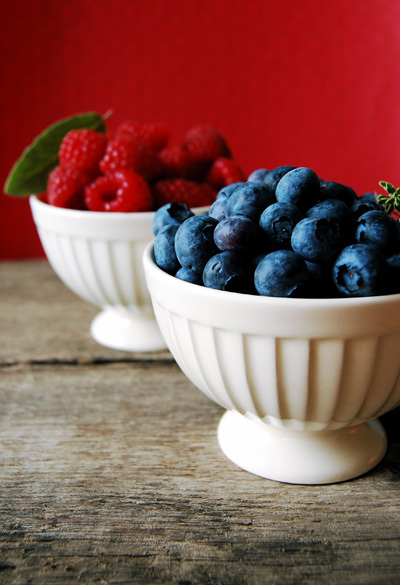 I love berries, and you have my two favourite there! I plan on attempting some sorbets this summer, and maybe a baked blueberry cheesecake :D.
Can't wait to see your baking though. wah its great! I want too! Just found your blog today and I'm in love. Cannot wait to explore more. Hope you have a great week Love! I love the cafe bowls with the little base, would you mind sharing where you found those?